When he offered to let me see what Black Swan had received a few days ago, my eyes popped. 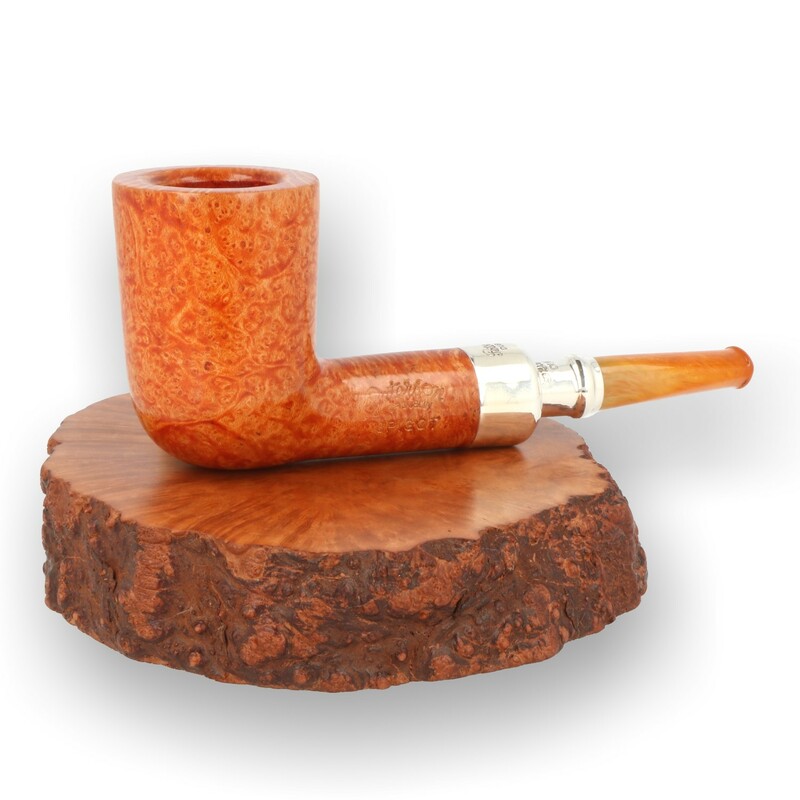 It’s not just the amber spigots, nor the incredible “A” bowls with their breath-taking birdseye or flame grain, but the combination that is so pleasing. And to see all these pipes together was so remarkable that I thought I’d pass along that experience to you with a minimum of commentary. Before beginning your tour, I would like to point out a few things about the mouthpieces. Notice as you go along that there are three distinct types of mouthpiece: a round-end with the draft hole in the middle, a flattened button which isn’t quite a fishtail, and a P-Lip. While the 50 kilos or so of amber mouthpieces were inventoried in the late 1930s, the three styles of mouthpieces tell us a little bit more. The orifice or round-end style predates P-Lip production and was abandoned during the 1890s, meaning these mouthpieces were fashioned no later than that decade. The almost-fishtail stems could date anywhere from the late 1890s to the time of inventory. The P-Lips, of course, date no earlier to the time of the 3rd patent in 1898. We know Charles Peterson and his young hand Jimmy Malone both worked amber, so there is the very real possibility that either CP or Malone actually crafted some of these stems. 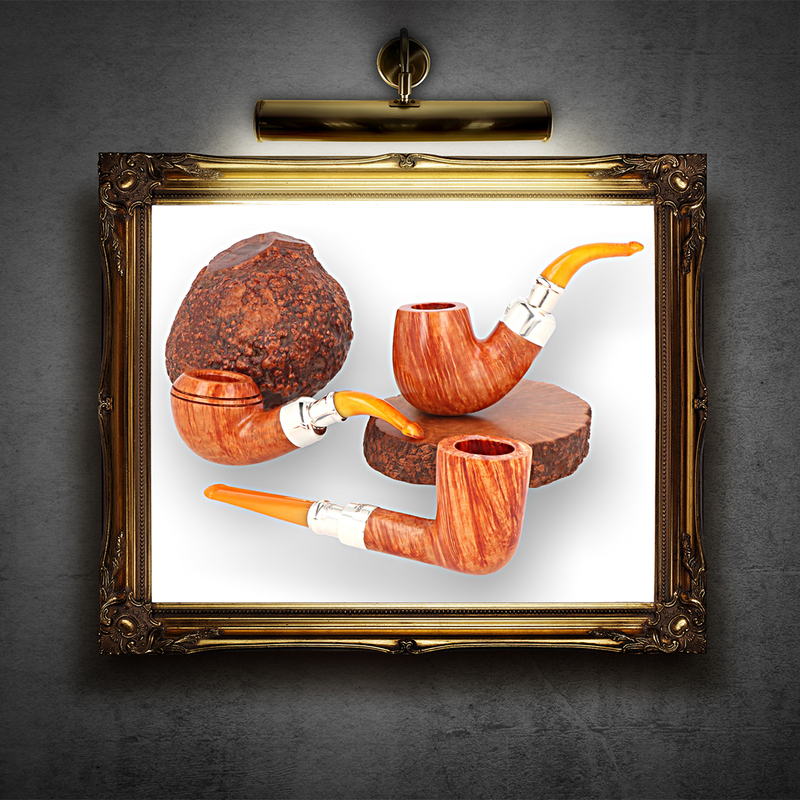 In the photo session Thomas Mason (the famous Irish photographer) did for the 1906 catalog, CP and Henry Kapp chose the amber and meerschaum work station not only for its prestige value, I think, but because Charles was justifiably proud of his skill as a craftsman. He always chose to wear his workman’s smock in any indoor photograph, while the other execs wore suits (that photo, of course, is in the forthcoming book). 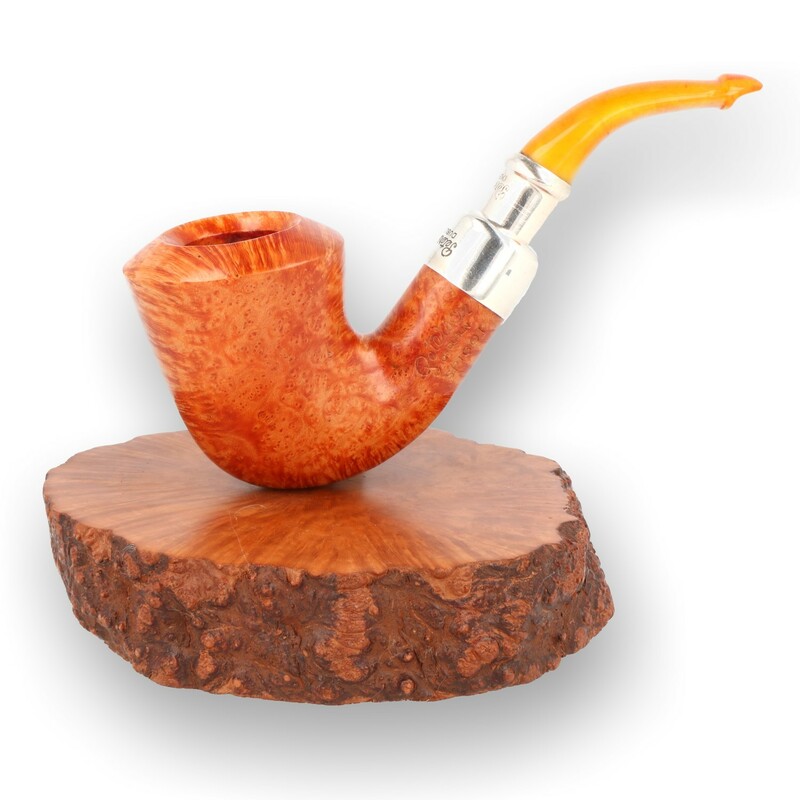 I know some folk have been a bit hesitant because of the hoop-lah over the fragility of the amber. There are still lots of vintage Petes in circulation with amber bits, some with quite a bit of dental chatter, and of course as a semi-precious “stone,” amber is brittle. 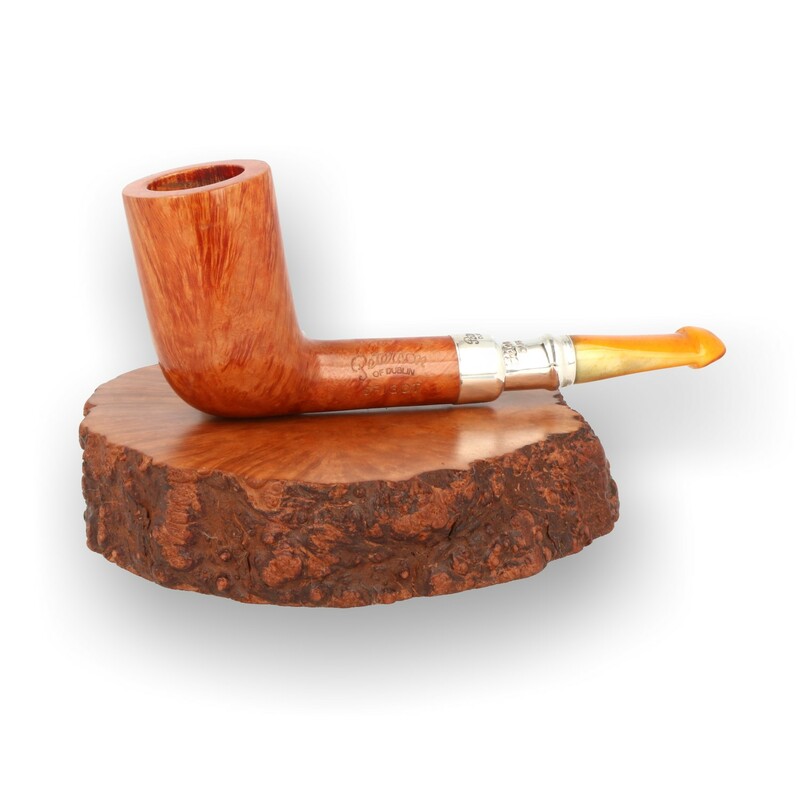 But it’s not more brittle now than it was when Peterson craftsmen originally formed it, and there’s loads of advice on how to take care of it and bring back its luster if it gets a little sun (a drop of olive oil and a silver polishing cloth). But if you decide to invest, I hope you’ll take my old friend “Trucker” Chuck Wright’s advice: “it’s just a piece of wood unless you smoke it. 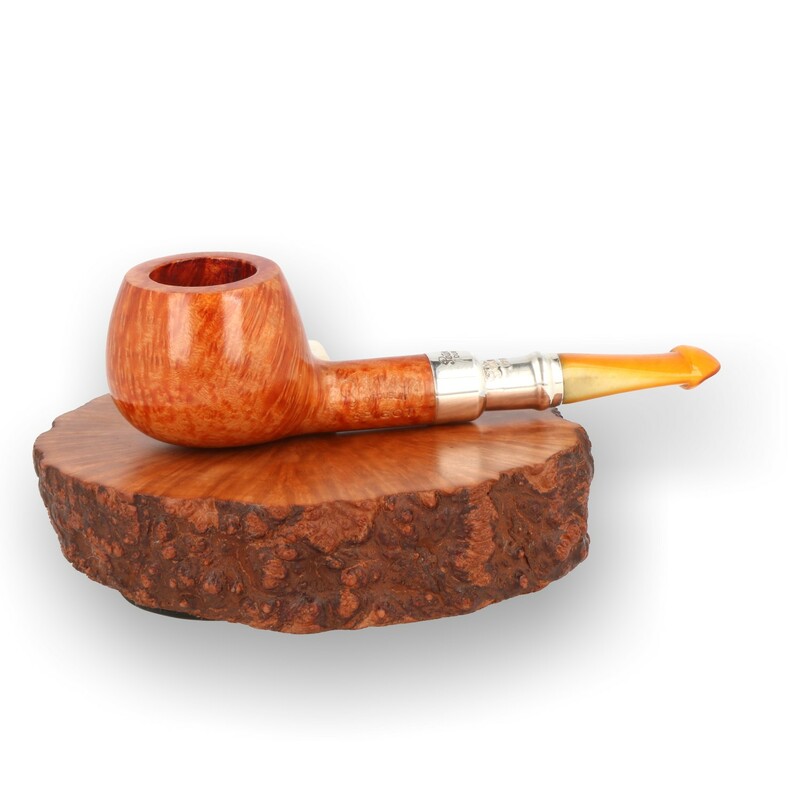 Then it becomes a pipe.” Fumare in pace! 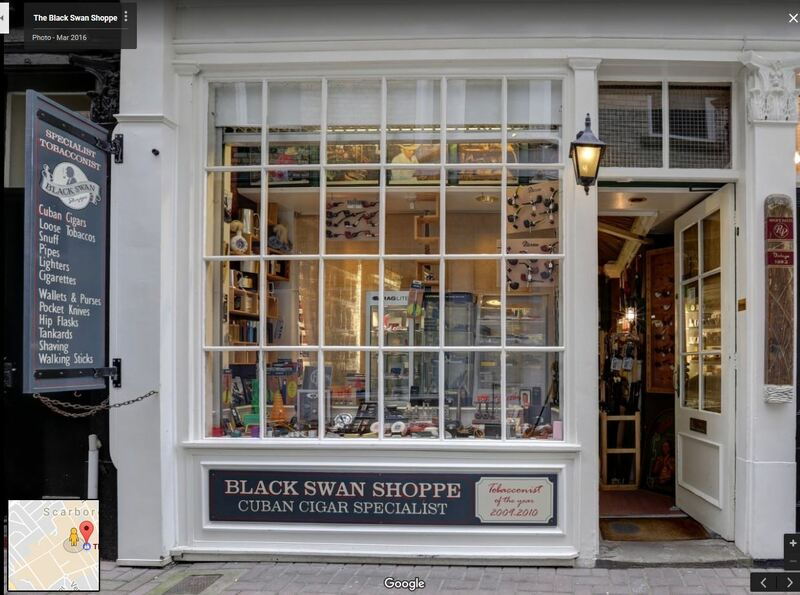 If you’re ever in Scarborough, be sure to drop by and introduce yourself to Kris Parry at the Black Swan Shoppe. 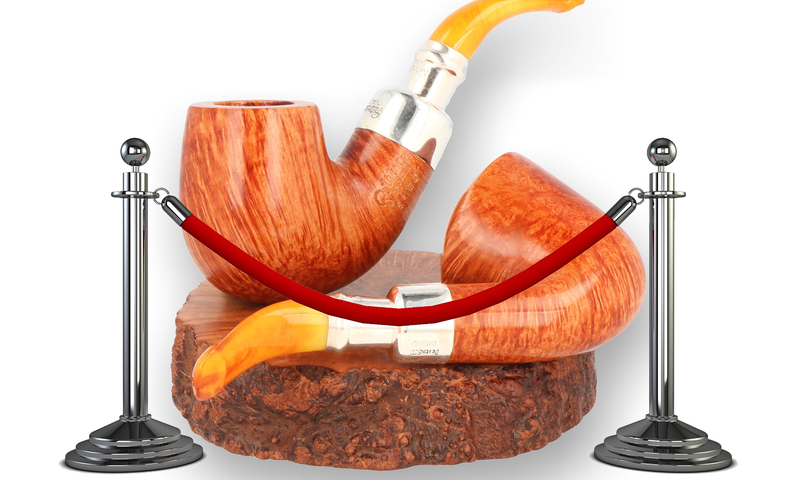 If you click on the photo below, you can see a card of Peterson pipes in the upper right side of the window display. * See https://petersonpipenotes.wordpress.com/2017/04/08/60-peterson-2017-product-catalog-a-well-kept-secret/. Kris has several of the latest gen Platos in stock, as you can see. It looks like some have the new acrylic P-Lips, some still have the vulcanite P-Lips. “Worth a peek,” as the old duffer says. I love the display and gallery style unveiling! 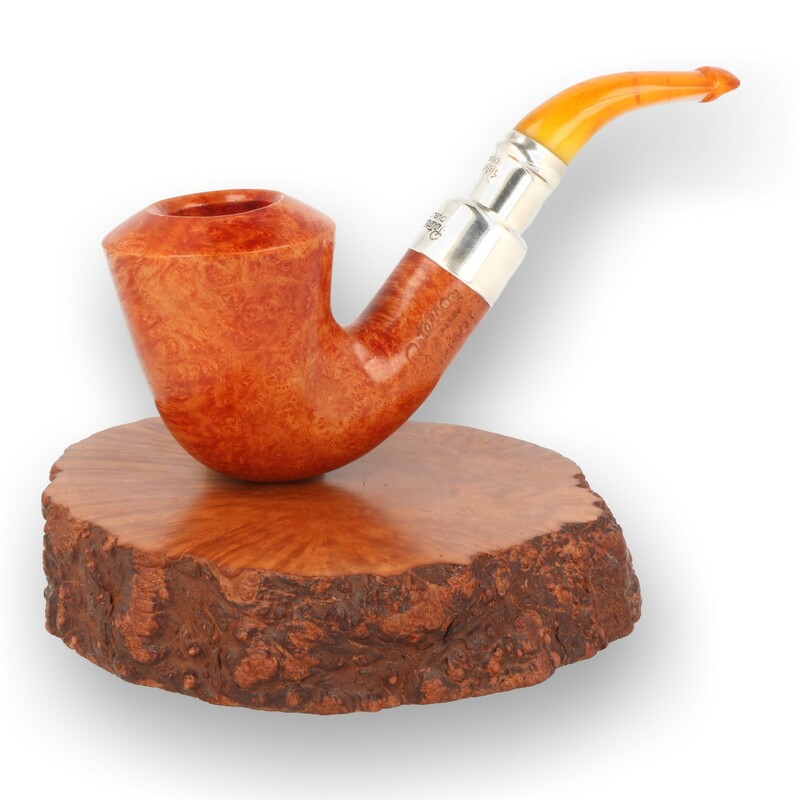 I’d love to see one of these Amber stemmed beauties in person. 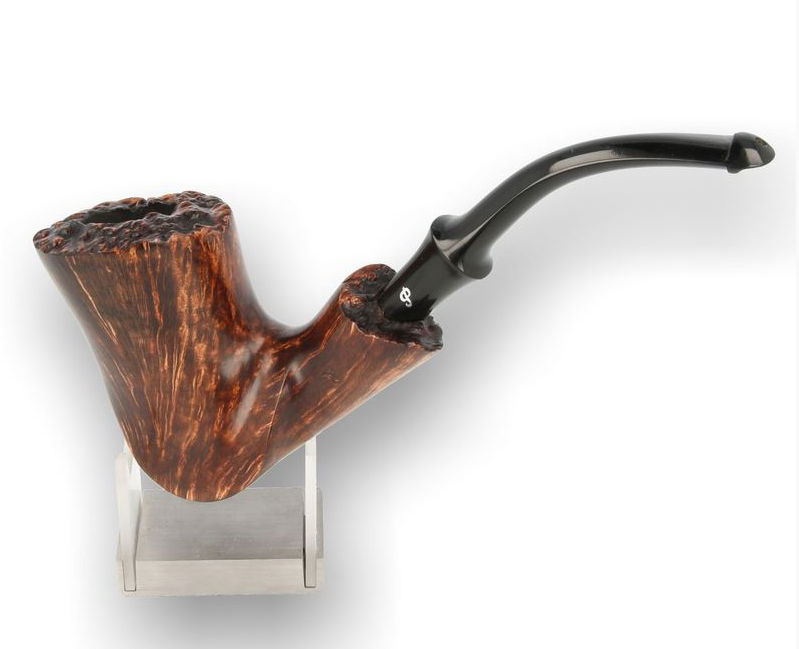 I’ve been looking at the few offerings online and from the available retailers/ebay vendors, they all seem to only have P-lip stem pipes. 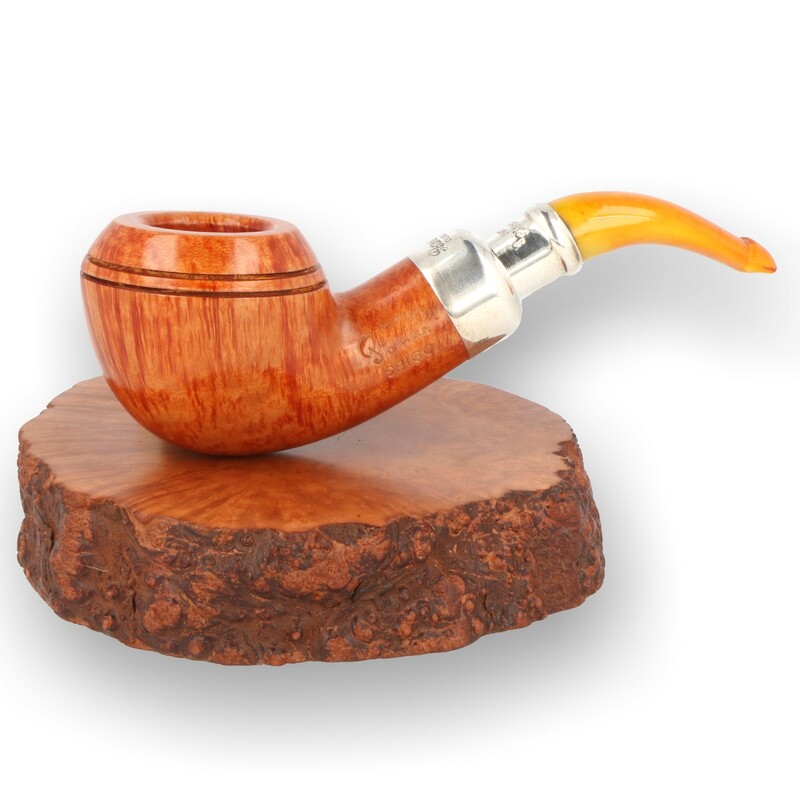 Most of the online shops only show one or two pictures of each pipe – do they all have the screw-in bone extension? I see the 999 example above lists the extension, but none of the 999’s available offer that detail. You’re exactly right. The retailers aren’t looking to see how the amber has been mounted. It’s nothing more than whether or not that particular mouthpiece already had a bone tenon in it or not. It’s not like Peterson can make bone tenons anymore. It’s long-gone technology. The thing to do would be call and talk to someone before making the purchase. These are all beauties, Mark, but the B10’s really speak to me! Gorgeous! Thanks for sharing. The B10 really shines here, doesn’t it? I have an old Rosslare natural with the faux-spigot in marmelade acrylic, and it’s one of my best. 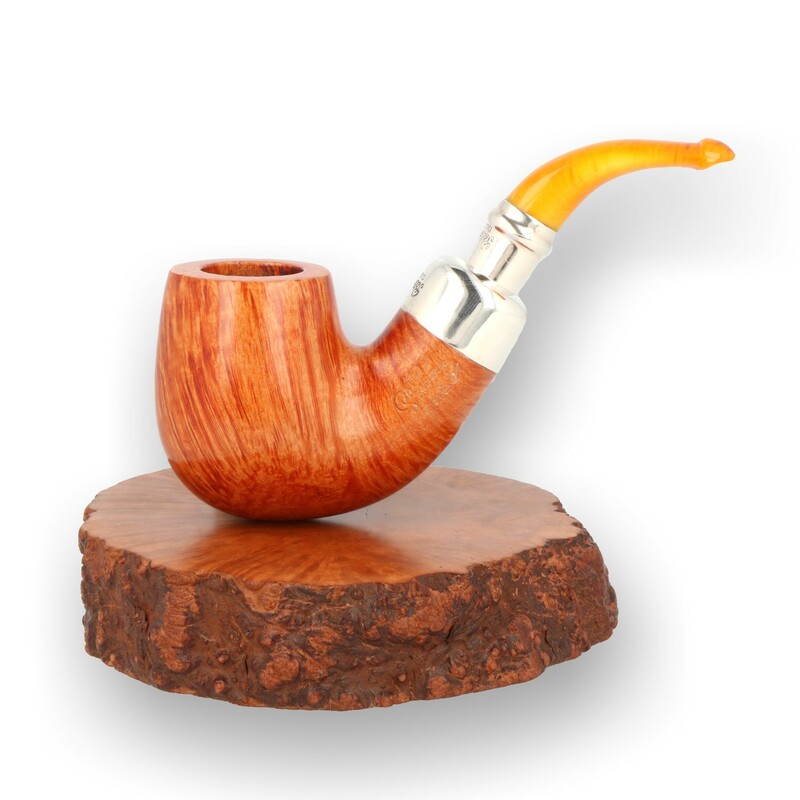 When the Amber Spigots first hit Smokingpipes.com I grabbed up a P-Lip 87, I was too slow to get an X220. Wow those pipes went fast. 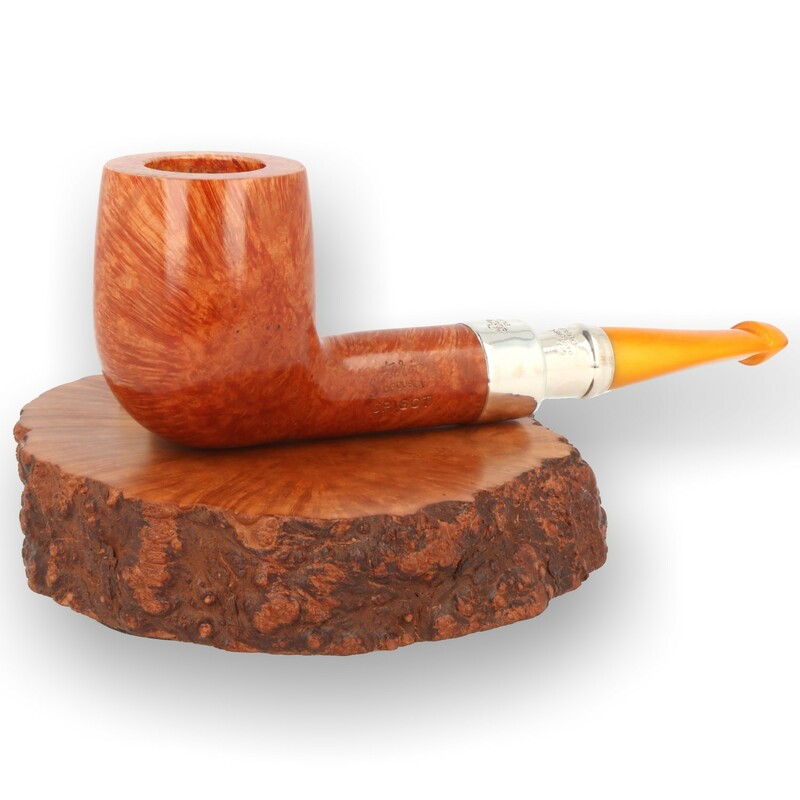 Later, I saw your peterson pipe notes post on the amber spigots. I saw that the X220 even had a bone “chimney”, dang missed out doubly. 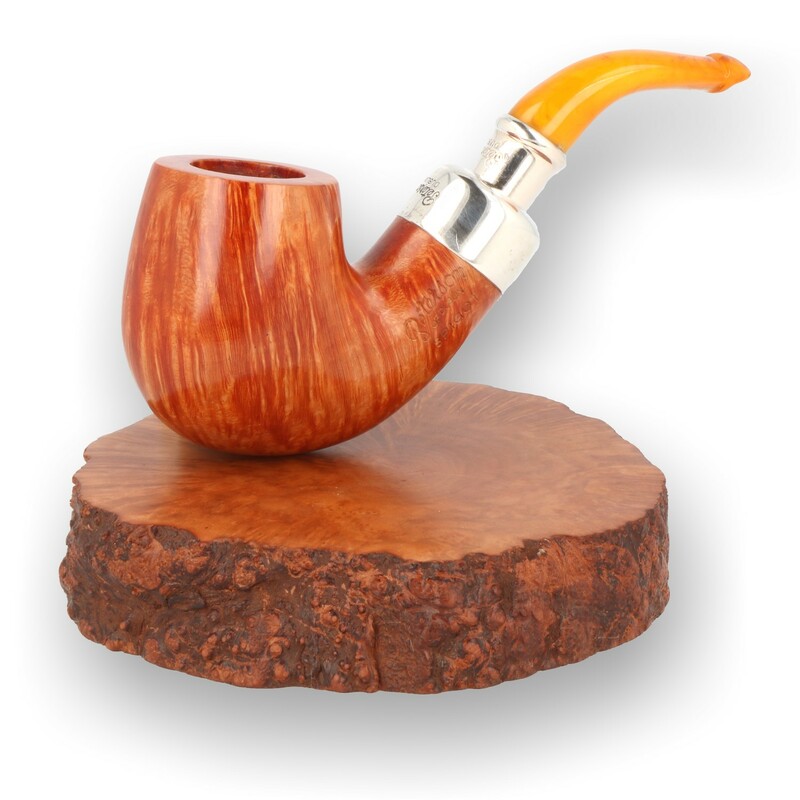 Anyway, a week or two later a single X220 Amber Spigot P-Lip came up on Smokingpipes.com. I did not hesitate and snatched it up as well. 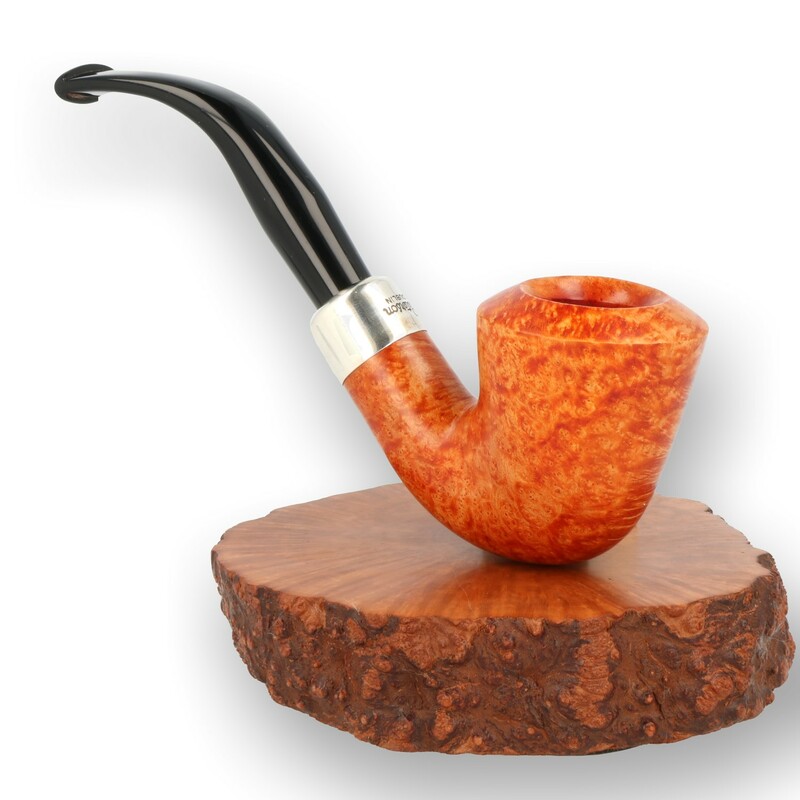 While waiting for the pipe to arrive, I had visions of the cool new pipe with the “old school” bone “chimney”. When it arrived, I went straight to the stem to ogle the old style tenon extension. What the $&@/:($?&@……no freak’in extension. The stem was threaded, although it looked to be very narrow. Anyway I looked through the box and bag….nope, no bone extension. I was very dissappointed. 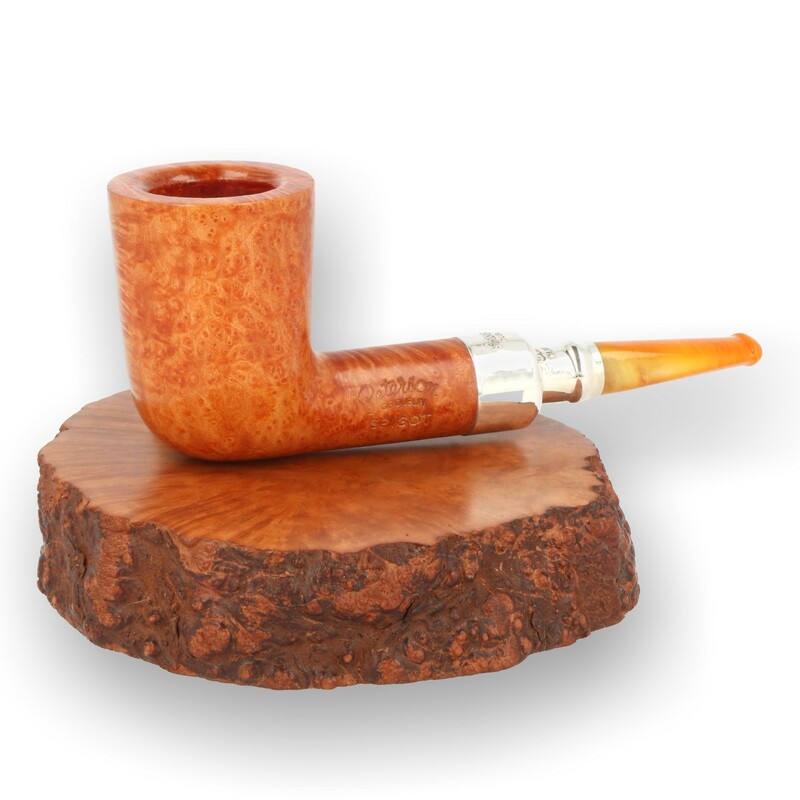 I called Smokingpipes.com and they said it did not have one. I sent Peterson an e-mail to find out what was up. They said some pipes did not have them. My stem was threaded, so I thought it should accept one. They agreed to send me a tenon extension, I specified and hoped for bone one. They said they have sent the tenon, but it has been months now and still no “joy”. My question, I guess is. Since you have seen a few of the X220 amber spigots, did they all have the bone extension, or were some sans extension? P.S. 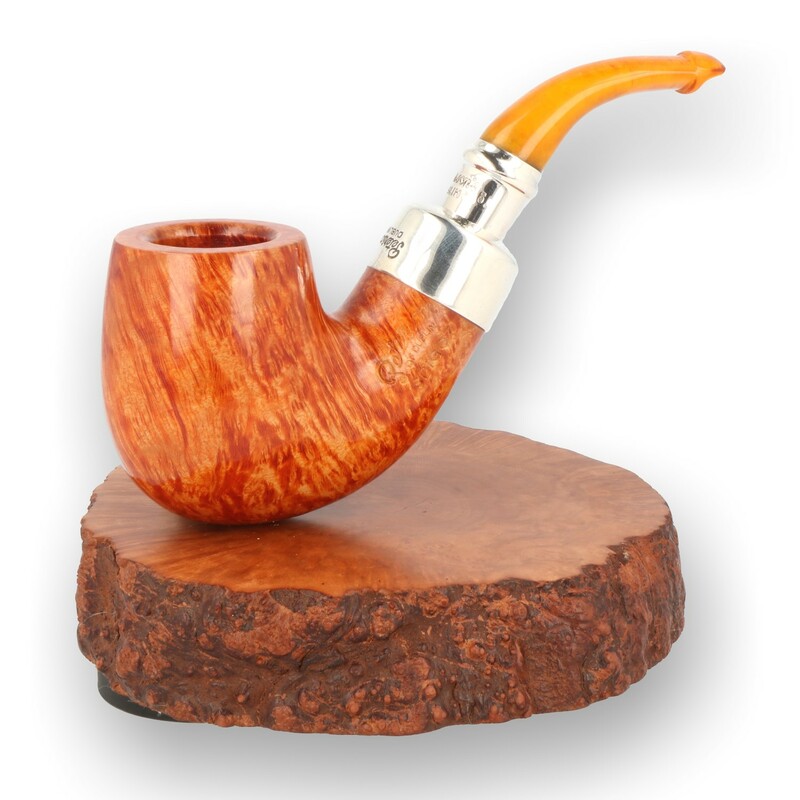 I somewhat wish that I had the extra acrylic stems for the amber spigots, but I would have wanted them to be a silver spigot mount as well anyway. 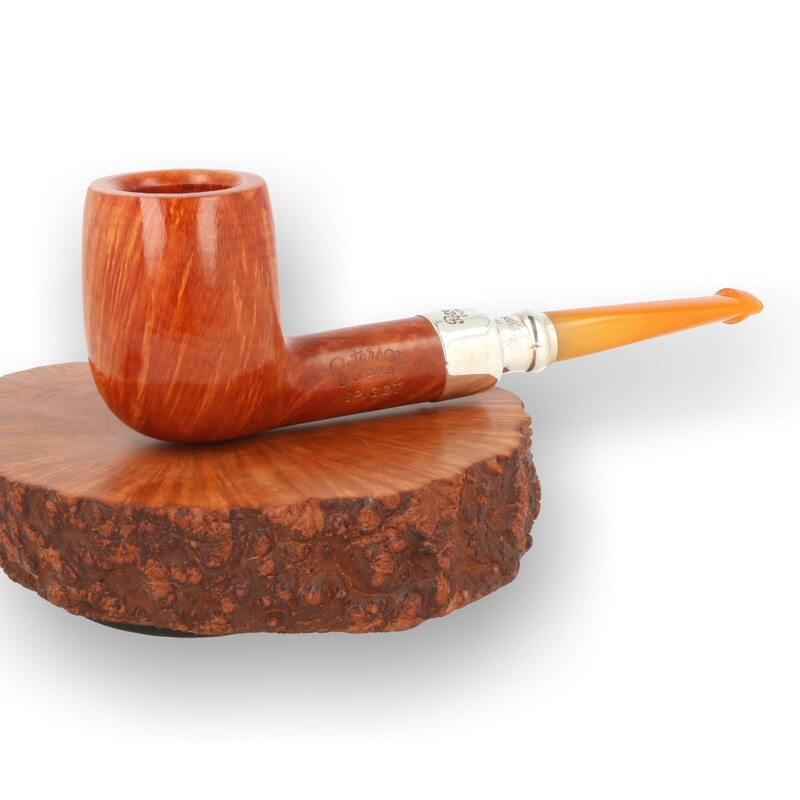 I am going to see if Peterson will fit some vulcanite or acrylic silver spigot stems for the two I have. I also could not pass up the Horn Stem Spigots that showed up soon after the Ambers. I snagged a 106 P-Lip. John, you’re exactly right–some have the extension, some don’t. 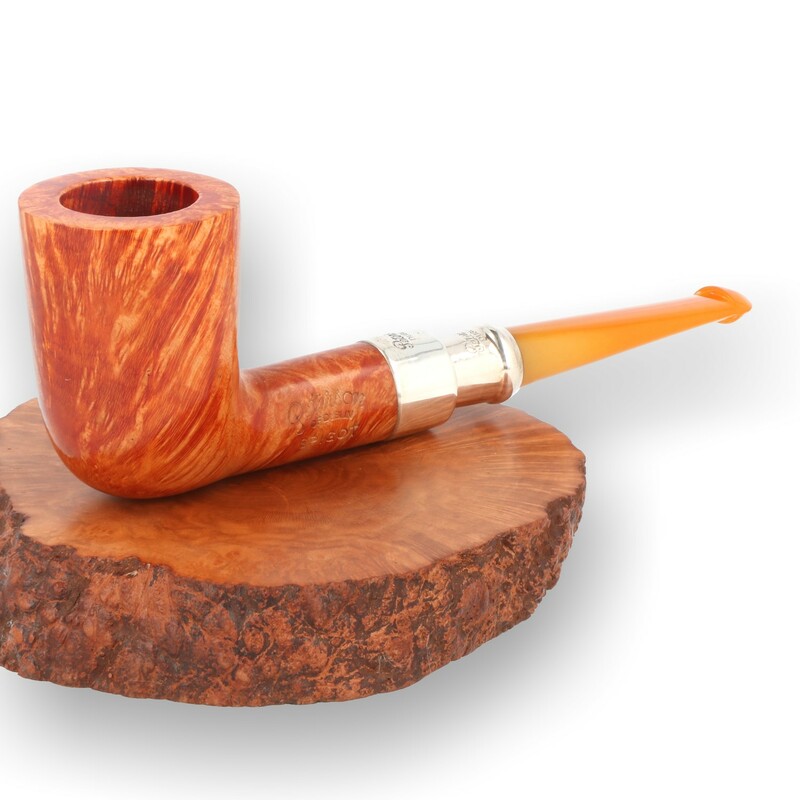 It would take a seriously dedicated Peterson vendor to indicate whether or not the amber had the old bone extensions. As I said above, it was just a hit-or-miss thing–the mouthpiece they pulled out had the extension, or did didn’t. Only thing to do is write and ask someone to look before making the purchase. You’ve got me to thinking, though. I think what I would like is an acrylic marmalade spigot as my duplicate mouthpiece. 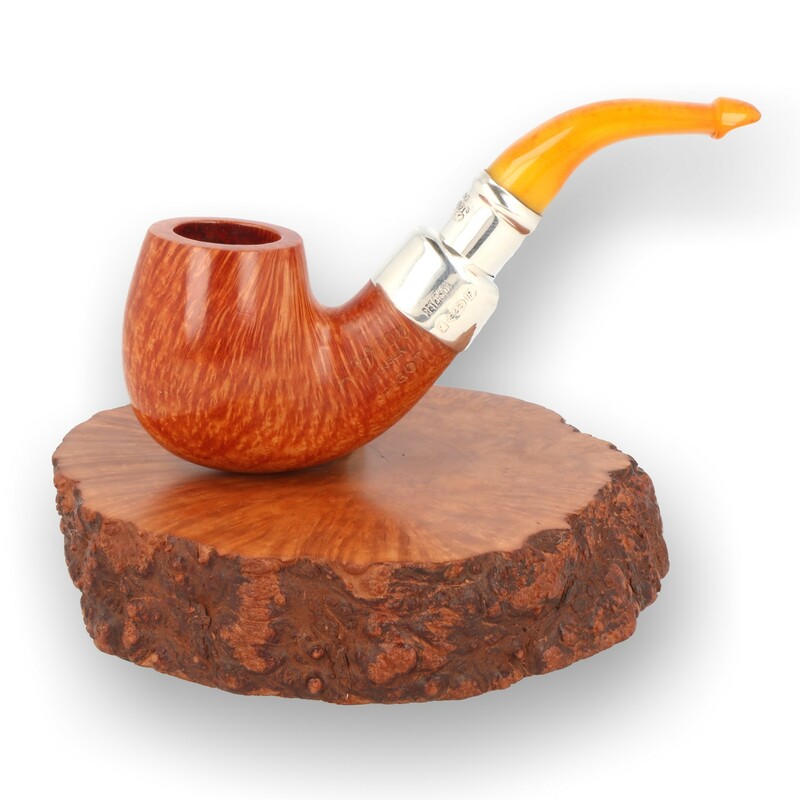 I say that because my early-issue Rosslare B10 (later called Royal Irish) had a faux marmelade acrylic spigot, and it looks fantastic with this color bowl. BTW, you can expect these natural orange bowls to darken over time. i have the model 15, with dual stems from last yr, and there is a .925 oval on my acrylic stem. i have i guess one of the button/fishtails, as well as the bonus Amber P-Lip Glen so graciously sent to me, with the new deluxe presentation box due to minor issues we encountered. They more than take care of the Customer, they work hard to Delight the Customer. Something that is sorely missing from the Big Box world we experience…you have to pay more and go to actual specialty shops to get this kind of pride in service here. Mark, I think you may be onto something with the marmalade stem. 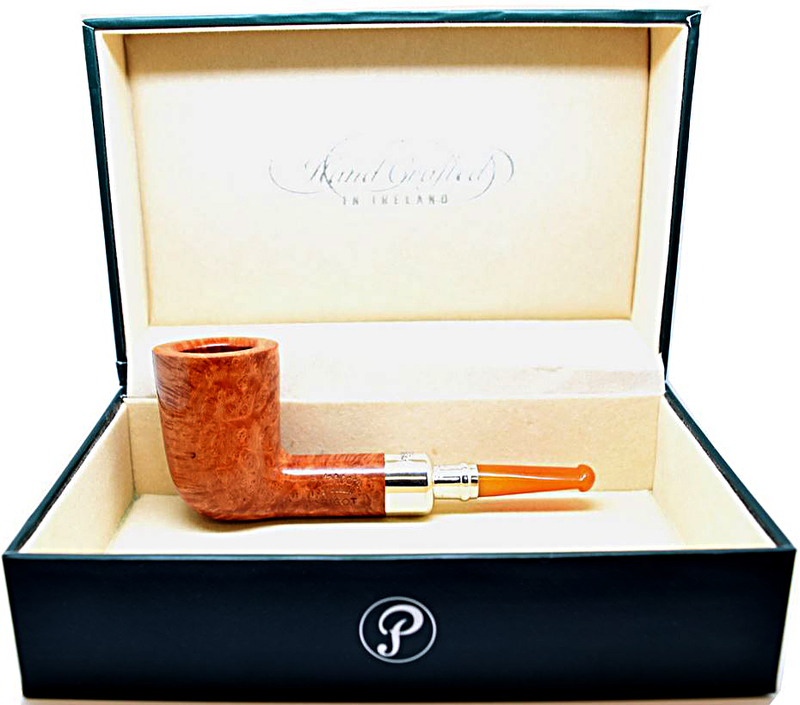 I have a Rosslare Classic B10 with that stem and silver band, and it looks great. Like the late Sandpiper said, you either hate them or love them. At first I was a hater because I thought they were a cheap imitation of amber. I have grown to like them for what they are, a nice change of pace. i, too believe the Rosslares are in the top 3 Beautiful Petersons. 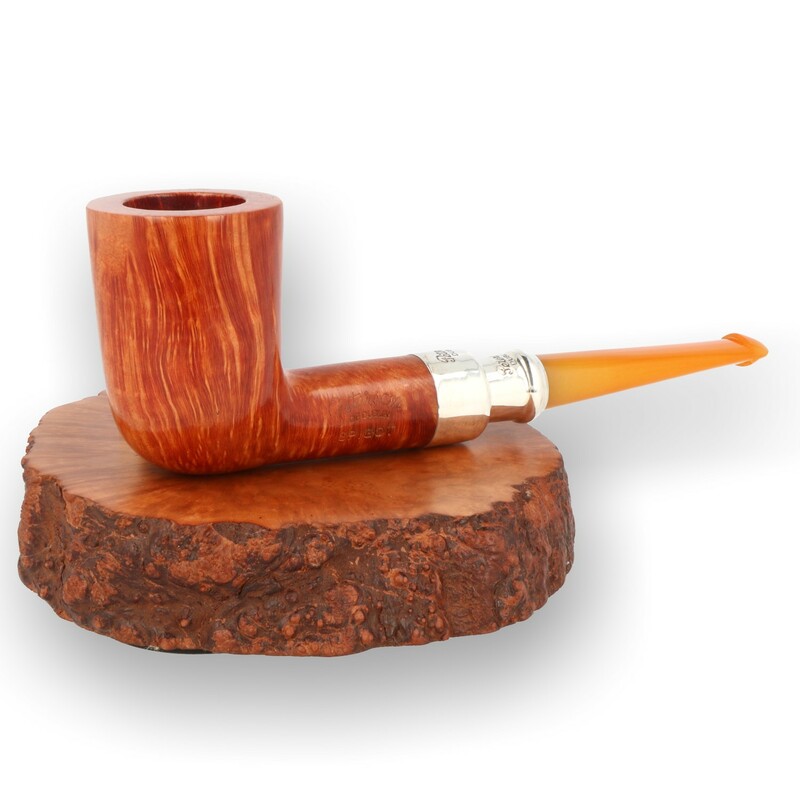 Before i lucked into the Amber/Acylic pair, that was the pipe i’d selected. i came up with a novel way to protect the amber, though im not going to stain the channels of these lovelies… get some 3M clear UV resistant Shrink tubing, as used to connect wires. i found a perfect size to fit these, used a blow dryer to shrink them, and now they have a wall between them and misfortune. If i were to smoke thru them, it would also be protected from chatter. Just an idea i came up with while working on an electric guitar. I know folk are always looking for ways to protect their investments, and this sounds like a good one.